Get visibility into your organization’s file transfers and workflows with GoAnywhere MFT agents. MFT agents are lightweight applications that work to automate your file transfers and workflows on systems (both remote and on-premises) throughout your enterprise. The agents are managed by a central deployment of GoAnywhere Managed File Transfer (MFT), which allows you to configure and schedule agent file transfers and business processes from an intuitive, browser-based interface. How do MFT agents work? When your file transfers execute, all log data is streamed from the agents (wherever they’re deployed) to GoAnywhere for consolidated auditing and reporting. This unique approach provides visibility into all the file transfers running within the organization. MFT agents can be installed onto almost any server or workstation where file transfers or workflows need to be performed. This includes Windows, Linux, UNIX, IBM I, and Mac OS systems. 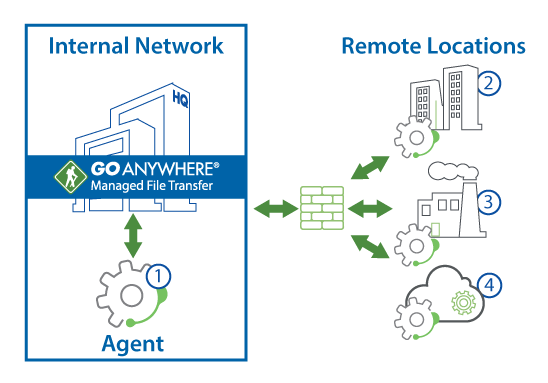 For organizations who prefer to perform their file transfers in the cloud, GoAnywhere MFT supports the use of agents remotely in cloud infrastructure such as Amazon EC2 or Microsoft Azure. Watch our on-demand webinar, Get the Most Out of GoAnywhere: Agents. Agents can be installed on servers or workstations in your network for transferring files from and to GoAnywhere and other systems for processing. The agents can perform additional workflows on the system where the agent is deployed such as copying files, running commands, or parsing data. Agents can be installed at remote locations to automatically monitor folders and transfer files on an automated basis. This “retail polling” feature is ideal for synchronizing files between a corporate data center and remote locations such as stores or branch offices. Agents can be installed on servers owned by your trading partners. When a trading partner places a file in a folder which is monitored by the agent, GoAnywhere can automatically pull the file to your organization's network. In turn, GoAnywhere can use those agent connections to push files to your trading partners. MFT agents can be installed on server instances within cloud infrastructure like Amazon AWS and Microsoft Azure. These agents could be used to move files securely between the cloud and your internal network. 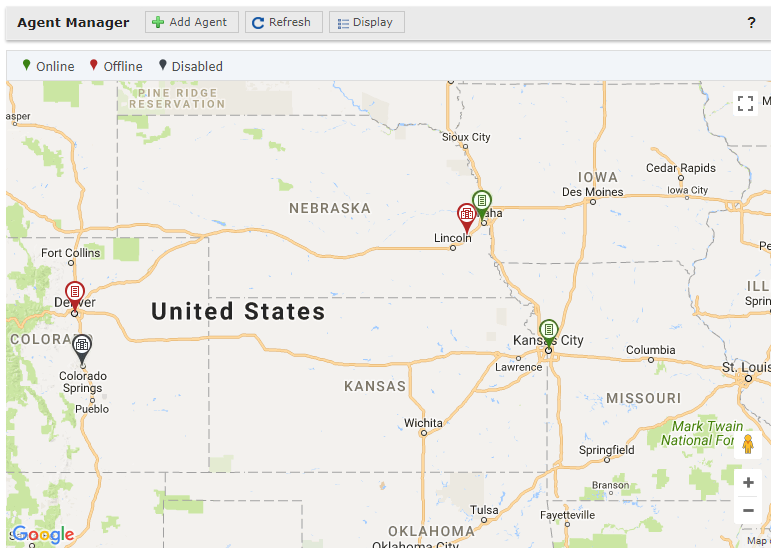 Agents can be visually monitored and managed via an interactive map. They are color coded to indicate if they are online or offline. Simply click on a pin location to launch the agent console. GoAnywhere is an MFT solution that centralizes control of all connected agents. Administrative users in GoAnywhere will configure the work that should be performed on local and remote agents and can also view events that occurred, such as file transfers or completed workflows. The communication between each agent and GoAnywhere is encrypted using SSL/TLS. The authentication is a multi-step secure process establishing trust between agents and GoAnywhere. Agents don't have their own individual user interface since administration is performed through GoAnywhere's browser-based console. Agents can be grouped together to simplify setup and configuration. This allows users to define tasks that should run on all agents in a group. For example, an organization that has hundreds of retail stores can easily roll out new files to each store in the group, or a group of Linux servers can be defined to execute the same shell scripts on all systems at once. GoAnywhere automatically distributes software upgrades to agents as needed. This is a seamless process in which GoAnywhere will upgrade agents while they are idle (to minimize disruption). Do you think MFT agents might solve a key need in your organization? Let us show you around! Request a personalized demo today to explore GoAnywhere MFT and see the agents in action.